Are you tired of giving the same old store bought mass-produced gifts that everyone else is? These homemade Christmas gifts will be something they’ll actually want to receive, and you’ll feel good that you made it yourself. The quality of these gifts has been pre-screened so you won’t find any DIY duds here. This mug is pretty standard on the top half, but the bottom half acts as a chalkboard, so they can leave messages on it. Great for spreading morning cheer or making sure everyone knows who the coffee belongs to. Be sure to gift this with some chalk so they can get started right away. This is a great way to take a teacup you don’t use anymore, but that looks really pretty, and make a candle worthy of being a gift. You’ll want to put it on a matching saucer, and they show you how to affix is so it’s one piece. This makes a very handy candle that they’ll be glad to receive. This hand scrub is a thoughtful gift because we all need to wash our hands, and the kitchen makes a great spot to do so, but using dish soap for the job isn’t ideal. It’s so easy to make, and the color makes for a great presentation when you give it to them. This bin has just the right mix of ingredients to keep them warm and toasty all winter long. They’ll think of you every time they have a mug of hot cocoa, complete with marshmallows and a shot of Kahlua. The process of making this is as easy as stacking the ingredients and dolling up the jar. Make your Instagram pics look their best with these coasters. They take your photos and put them into coaster form so they’re super useful, and also super thoughtful because you can personalize them for the recipient. They’re made in a way that will make them last for awhile, even with repeated use. Keep loved ones always on their mind with this family keychain. It starts by changing pictures from color to black and white, and then affixing them to a series of keychain tabs, one for each family member. It’s a handy way to for them to remember their keys, and always see their family members smiling back at them. These little lambs are cute as can be, and great to snuggle up to all winter long. They play into the Christmas theme as one of the animals that was present at the manger for the birth of Jesus. Lambs signify purity and meekness, and will add some character to their decor. Sure, you can buy jars of Play-Doh at the store for a reasonable price, and it says it’s non-toxic, but when you make it at home you have more control of what goes into it. These steps show you how to make as much of the dough as you want so that your child can make all sorts of creations, in lots of different colors. This peppermint scrub feels ultra luxurious, and they’ll never guess that it’s easy to make from sugar, mineral oil, and peppermint extract. Presentation is key here, so as long as you put it in a nice jar with some ribbon around it as shown, this is not only a thoughtful gift but also very useful. These steps show you how to take ordinary brown paper grocery bags, the kind you probably have a stash of right now, and make a decorative basket that you can make to hold another gift, or to use as a gift itself. It’s sturdy enough to be used, and looks like a hand-crafted piece of art rather than common grocery bags. Here’s a way to give them a piece of furniture that you can make yourself. There’s only six pieces of fabric used to make this, two pieces for the top and bottom and four pieces for each side. You then stuff the insides and you now have a pour suitable for an ottoman or a chair, and can even double as a coffee table. This is a great gift for the seamstress in your life. It takes everything you’d need in a proper sewing kit and puts it in a handy dandy jar so it’s all self contained, and doesn’t take up much space. By putting the pin cushion on top there’s no wasted space when it comes to this jarful of sewing goodies. They’ve just gotta have a coffee cup sleeve if they’re a coffee lover, and this is a way to cater to their morning mood. It has a button and a loop of string on it so that it can easily be reversed depending on how they’re feeling. Make one side quaint and flowery, and the other side a little edgy and amped up. Shadow boxes just look nice and are a definite crowd pleaser, so this is sure to be a hit no matter who you give it to. If you like your DIY Christmas gifts to come out exactly how they look in the picture, this how-to gives you a link right to the exact materials that were used so you can replicate it spot on. For those leisurely market strolls you can’t beat one of these bags, and they’ll be much appreciated by those that need a good-sized bag that’s easy to carry. The patterns are included so there isn’t much guesswork, it’s just a matter of picking out the fabric you want to use. This gives any family a feeling of officiality and almost serves as a family crest. It features the initial of the family’s last name, and the year they were established, just like you see on a corporate building. You can mark the year they got married, or their first home. This is a gift they’ll be happy to hang up and keep for years and years. This denim purse is made from jeans that are past their prime, but still have a lot of durability left in them. With a few enhancements it makes a pretty purse, one that can take beating and still look good, as well as being totally washable in case it gets messy. This step-by-step shows you how to package a bread and jam gift in such a professional way it will look store bought. It includes labels for both the bread and the jam, and presents them in such a way that they look like they were made to go together. Cosmetics are always a good gift to get someone, but there’s no point in spending loads of money on a product you can buy at the store when you can make an all-natural one for less. With just four ingredients, this body scrub will have amazing effects on your skin. Is there anything better than drinking a delicious cup of cocoa in December, after a long day of Christmas shopping? These DIY hot cocoa stirrers will make a perfect stocking filler for your loved ones or maybe even added into your kid’s Christmas Eve boxes as a before bed treat. Everyone deserves at least one unique gift in their life, and this DIY abstract painted scarf is perfect. Knowing that someone has taken the time to make it for you instead of picking one off the shelf will mean more to them than anything this year. There is nothing worse than having frozen fingers in the winter, and not being able to text your friend to tell them where to meet you is frustrating. These DIY texting gloves will be the solution to that problem and, because you’re making them yourself, you can choose the color and pattern to suit. One of the best things technology has brought us is the ability to cook new and exciting foods, but finding somewhere to prop your iPad on while you’re reading the recipe can be difficult – that’s why this DIY holder is ideal; you’ll be able to cook tasty foods while keeping your iPad clean. Coconut oil is really good for our skin, we all know that by now. This DIY coconut and lime sugar scrub will make the perfect gift for someone this year, and because it has just four ingredients, you’ll know that there’s no added chemicals in it. Knowing what to bring the hostess of your party is tricky, especially when you know she probably has everything anyway. Make her these DIY hand stamped wooden utensils for her kitchen and because you’ve made them, she won’t have anything like them. They’d make a lovely housewarming gift for a newly married couple, too. Our feet deserve the best. They hold us up all day through work, play, and even the Christmas shopping. Give them a little pamper when you’ve bought the last present with this DIY foot soak. Made from natural ingredients, this will be the treat your feet deserve. Perfect for fans of all things video game, this DIY Super Mario Bros. money box will look perfect in their gaming den. It’s easy to make and their coins are readily accessible as the top comes off, meaning they can get to their loose change whenever they need it. Keep all of your hair grips, nail polish, and makeup in one place with this DIY leather tray. It’ll look amazing on top of your vanity table and you’ll never have to hunt for that one lipstick again. This tutorial even contains a template for you to print out and use. A thick blanket is perfect to snuggle up under when you’re watching Christmas movies, but you don’t have to buy it from a store. Instead, this blog post contains the perfect tutorial for you to learn how to arm knit a super cozy blanket for you to keep for yourself or to give as a gift. These DIY monogrammed hand towels would make a lovely gift for you to give to someone as a housewarming present. This tutorial from Martha Stewart will show you how to make them and give a personalized touch to any bathroom in the house…and they’ll always know whose towel is whose! Journals are amazing, you can use them for a number of things – making lists, jotting notes down, or maybe even creating a bullet journal. Don’t just get a readymade one, though, because this DIY embossed one will go down a storm. It’s so easy to make and it’ll be a lovely Christmas present, too. Terrariums are beautiful – they make a lovely addition to a desk or shelf. This DIY kit will make a wonderful Christmas present, and it gives people the ability to create a plant in a jar that they’ll truly love. It’ll definitely be a unique gift that they haven’t received before. The beauty of this gift is that you can make is spell out whatever you want. Popular holiday messages include Peace, Hope, Love, Joy, Snow, and Elf, but you can use your imagination, or the recipients name, or make a few ornaments that make up a bigger message. Three distinct spices make up this world tour, and you’ll be introducing them to new flavors from all over the world. Each spice mix is handmade, and there are recipes for each one. You then bottle them up with a bow and you have an instant gift. It’s easy to increase the recipe to make multiple gift sets. Here’s a way to turn ordinary modern pictures into old-school looking vintage photo canvases. It only takes a handful of materials, and they show you the tricks to make them turn out like professional art. Make any picture look timeless with these awesome canvases they’ll be sure to hang up in their home. A bonsai tree is a thoughtful gift for anyone that likes gardening, or is a fan of Japanese culture. But did you know that you can make a bonsai tree quickly and easily as long as you have a plant available to use. You simply take a piece of that plant and make it so it will start to grow as a miniature bonsai. Satisfy their sweet tooth with these homemade gumdrops. They come in all different colors but are all the same flavor, as you simply add a different food coloring in to get the different color. You can make as large an assortment of colors as you want. They even include the PDF for a cute Goodie Goodie bag tag so they end up saying goodie goodie gumdrops. These magnets are made out of jar lids are custom built to hold your favorite family photos. They show you how to decorate them up for use as a Christmas gift, so you can surprise them with something totally personalized, and something that is sure to adorn their refrigerator the for next year or longer. This giant candy topiary is something they won’t soon forget, or be able to finish eating. That’s because it’s made with tons of candy bars, but made to look like a tall, thin Christmas tree. They say money doesn’t grow on trees, but this candy tree sure makes it look like candy does. Behold, the latest trend: cakes in jars! These jars are filled with yummy cake so you can give them a sweet gift in a sweeter packaging. They look like they’ve been crammed full of yummy pieces of cake, and they’re perfectly portioned and ready to be eaten right from the container. This chess set has all the pieces you’d expect in a proper chess set, but each one is made with nuts and bolts to give it a construction feel to it. Make sure that the white pieces are extra new and shiney, and then it’s a matter of painting the other side black. This body scrub turns out smelling and looking like some of the fancy stuff you’d pay big money for in a department store, but is simple to make and just as effective. The great part is that it’s made with all natural ingredients, so they’ll know what they’re putting on their body and be able to pronounce all ingredients. This gift will have them believing their opening something new because the top will be unopened and ready to be popped. The trick is that you’ve carefully undone the bottom and replaced what was inside with the gift of your choice, in this case they’re using candies but it can be anything that fits. This six-pack of reindeer is sure to put a smile on their face. It’s using IBC Root Beer as the base, and doctoring them up so that they resemble everyone’s favorite reindeer. Drinking this will be delicious, but having them around for decoration is the best part. 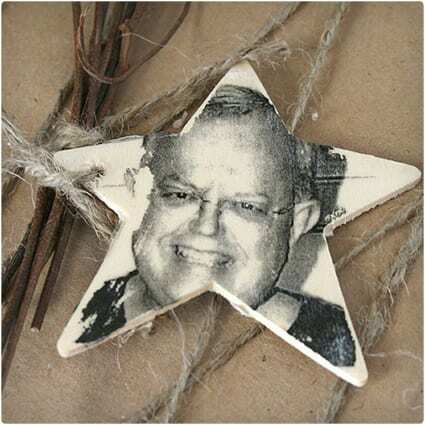 Simple steps and materials make this a fast and fun gift to make. Winters upon us and that means cold fingers and hands, and achy joints. Make them this heat pack and they’ll be able to stay warm through it all, and think of you each time they get a warm up. It’s made with rice and a bit of essential oils so it’s all natural and you don’t have to worry about some of the strange chemicals used on other heating packs. These necklaces come out looking so good that they won’t believe it started out with some simple washers. Here they’ve stamped them with the word Believe but you can make whichever message you find appropriate, and use your own creativity to make it special and personalized. Once you have the materials in place, this is an easy process. It’s incredible that you can make a fashionable scarf using an old t-shirt that you don’t want anymore. You’ll find similar scarves going for a lot more at some of the brand name stores, but making a replica for next to nothing out of pocket just can’t be beat. Winter brings with it chapped lips, so this is a very thoughtful gift, and one that is sure to get used up over the coming weeks or months. The balm itself just requires mixing together the proper ingredients, and then it is a matter of packaging this for a nice presentation on Christmas day. These lace plates look amazing and it all starts by using vintage doilies as the pattern. They come from artist Maggie Weldon, and there is a tutorial provided to show you how it’s done. These decorative plates are meant to be displayed and aren’t meant for daily use. Give them peace and serenity this holiday season through the magic of these bath bars. They’re shaped like gingerbread houses and look good enough to eat, but they’re meant for the bath. If they’re in need of a holiday spa day they’ll surely appreciate this gift, and these are large enough for multiple baths. These rings are made out of decorative spoons that you’re no longer in need of. When they’re finished they don’t look like spoons any longer, and the only thing that is left is the decorative handle, which has been wrapped around for a comfortable fit. There’s printable instructions and even video tips on how to get this done. This coin purse is billed as being able to hold everything all in one place. While it may have started out as being a coin purse, it’s big enough to hold a smartphone and other items as well. That makes it a great gift for anyone that has trouble keeping track of their things. These belts look good enough to be sold in stores, so they’ll never suspect that you made it yourself. The great part about them is you can totally choose how it will look by deciding on which style of leather cord you want to go with. It’s from Martha Stewart so you know it will turn out looking amazing. You might have seen similar vases for sale in stores, or even antique shops. But now you can make these as gifts, and can make different sizes and styles as you see fit. You can make a set, as shown here, or you can give them as individual candle holders. This rainy day jar kit is full of plenty of stuff to do on a rainy or snowy day, when going outside might not be an option. It’s a great gift to make as an emergency backup for when you don’t know what to do for an activity. By giving this to your kids you’re really giving yourself a gift too. This wind chime will really brighten up their outdoor areas, and also sounds nice too. You’ll find two different ways to make this, either by drilling a hole into the sea glass, or by wire wrapping it, whichever is easiest for you, your skill level, and the materials you have on hand. If they’re a fan of the regular-sized Yahtzee game, they’ll no doubt love to receive this oversized version that is meant to be played outdoors. The dice are big wooden cubes, which make it fun to try and hold and throw all of them at once. It’s then simply a matter of making weatherproof accessories like score pads. For jewelry lovers there’s no more thoughtful gift than a case that can hold and display their jewelry for easy selection at the start of the day. There are dozens of awesome looking earring holders, ring holders and more, so pick which one suits their style best and get it done in time for Christmas. 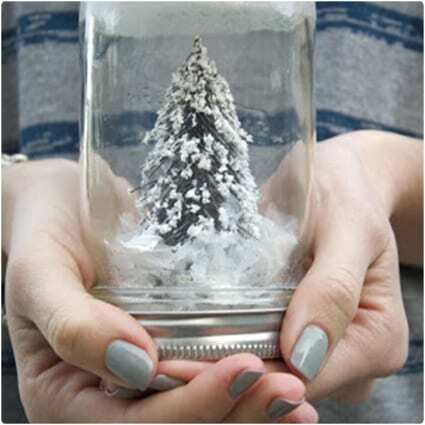 These mason jar snow globes look great on the windowsill, and are made from easy-to-find materials. They feature a single white pine that gets dusted with snow each time you shake it up. It’s a rustic-looking take on a holiday classic and is sure to bring glad tidings and cheer to them. 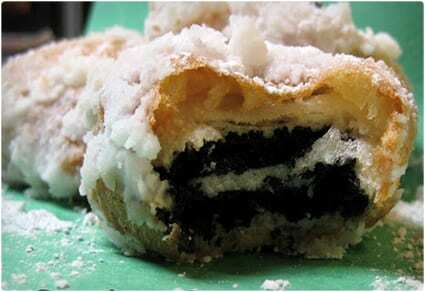 Everyone loves receiving edible gifts, and these fried Oreos are sure to satisfy anyone with a chocolate addiction. They take one of the most popular cookies on the planet and fry them up, and roll them around in powdered sugar for good measure. Put these in a decorate box and you’re all set. Call them Fried Joy to the World. 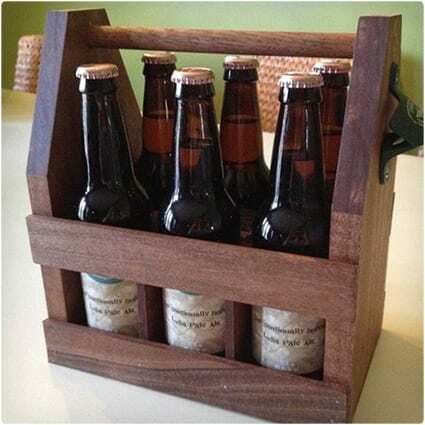 For any beer lover in your life this wooden six pack holder will go over nicely. It replaces the flimsy standard cardboard carrier, and is a serious upgrade. No worries about your beers falling out or banging into each other. And it includes an opener right on the side of it for convenience. They show you how to make these glass pendant necklaces which give you plenty of customizable options, so you can tailor them to the fashion sense of the recipient. They turn out looking really good, and if you package them as shown they look professional made. There’s also instructions for glass marble magnets they may enjoy. Here’s a great gift for the kids if you’ve got an upcoming road trip or long plane ride. This is a book that built to travel, and includes everything they’ll need to do arts and crafts projects while on the go. The page are designed so they can log their journey, which will keep them occupied as well. This ukulele comes as a DIY kit so you won’t have to go all over town trying to find all of the pieces you’ll need. You still get to put it together and add your own design to it, so it’s very easy to personalize for the recipient. You can paint right on it, so the sky’s the limit for how it will look when finished. A smartphone case is a useful gift that will make it so they think of you each time they use their phone. There are so many different design ideas that it’s easy to find one you think they’ll like, and even easier to put it together using common arts and crafts materials. These memo holders are made from tiny plastic animals, so it will be up to you to play Noah and decide which animals make the cut based on which animals you know they like. You can further customize this by putting special memos on the holders to get them started. They give you the template to print off the labels on these massage candles, so they look like something you bought, but they’re actually something you make. The scent is called Frosted Cranberry, and this will appeal to anyone that enjoys scented candles or cranberries. These should provide additional relaxation, just with their smell. These cute little fluff bears are made from eyelash yarn, so they’re going to be super fluffy, fuzzy, and soft. They’re also adorable, and fun to make in pairs so they can have a buddy. You can give them special accessories too, to make each one unique and memorable. Luckily they provide the link to the quilt that was used, as well as a downloadable pattern, because these snowman pillows look great and make a great gift. You end up with three different pillow designs, each featuring a different snowman design. A sure way to help them get into the holiday spirit. If you’ve been looking for a DIY Christmas gift for the geek in your life, this one is it. These are the designs of the old Space Invaders game, and they can now adorn the tree as they mount their attack. Be sure they played Space Invaders, because this is some retro nostalgic nerdiness here. This is sure to be their favorite towel, because c’mon, it’s a shark towel! It has a row of big white shark teeth and a fin that form a hoodie at the top, so it looks like a shark is eating their head. It’s also a great way to make sure that their hair gets dry, and all towels should really be hoodie towels. This accordion wallet is made from a design of your choosing, so you can pick something out that’s really nice, and really fits their style. It’s a gift that is super useful, and one they’re sure to use on a daily basis, so they’ll always be thinking of your great gift. This is a very easy way to spruce up an ordinary bottle of wine and make it special for the holidays. Since the windmakers did most of the work, you really don’t have to do much other than print off the labels and affix them to the bottles, but it really makes for a nice presentation. A wonderful gift for baby’s first Christmas, this hooded towel makes them look like Rudolph, and is just screaming for a photo that will generate plenty of Likes. They give you the patterns, so it’s just a matter of hunting down the right towel pieces and fabrics to get the job done. 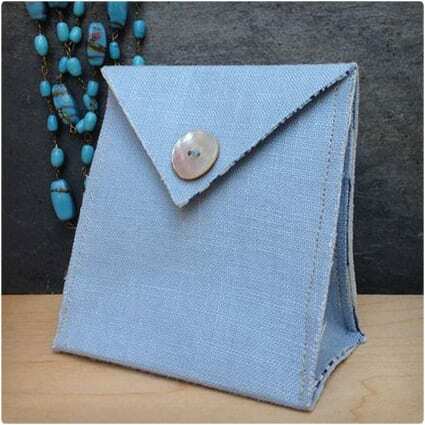 If you know someone that has a laptop but no case for it, this envelope clutch might be just the thing they need. It’s just the right size for most laptop sizes, and it doubles as just a clutch if they don’t need it for their laptop. Instructions are given for multiple designs for you to choose from. These snowmen have everything they’ll need for the perfect cup of hot cocoa all in one place. The heads have the marshmallows, the bodies have the cocoa powder, and the base contains peppermint candies to have after or to drop into the chocolate for a minty version. These gold leaf bowls look so pretty they might just want to display them and not use them as a place to store their car keys. They are relatively easy to make, as long as you have all of the materials ready and don’t mind making a few mistakes until you get it right. Here’s a really special way to label their gifts. It involves transferring an image of the gift recipient onto a wood tag, which then gets placed on the gift. The cool thing is that these double as ornaments, so after they open their gift they can put their ornament on the tree. Last but not least you’ll want a nice gift bag to put all of your crafty Christmas gifts into. This fabric gift bag makes a great choice, and of course they get to keep it as an additional gift from you. They’re easy enough to make, so you can make several at once for all of the people in your life.